This article surveys perceptions of the Balfour Declaration in Palestinian thought through the 20th century and onwards, by analyzing newspapers, books, speeches and one caricature. The main argument is that the common Arab and Palestinian claim that Jews do not constitute a people in the modern sense but a religious community has a strong connection to the relations between Zionism and Imperialism since 1917. The British promise of a national home for the Jewish People in Palestine contributed to the emergence of the Arab discourse on Jewish nationality; that discourse peaked after 1948, when the negation of Jewish nationality became an official plank of Palestinian ideology. The article shows, however, that before 1948 central members of the Palestinian national elite recognized the idea of Jewish nationality, and in the 1930s were even willing to compromise with Zionism and the British Empire and recognize “spiritual Zionism” as an ideological framework for the existence of a Jewish national home in Palestine, according to the promise given in the Balfour Declaration. 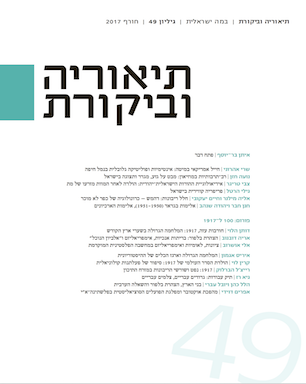 The article focuses on Yousef Haikal, a local Palestinian leader and intellectual from Jaffa, whose thought illustrates the role played by Ahad-Ha’am's writing in shaping the pragmatic Arab approach in the 1930s. By way of conclusion, the article calls for further research into the notion of Arab recognition of Jewish collective existence in the Middle East, as opposed to modern European attitudes towards Judaism, which are manifested in the Balfour Declaration and its implicit policy to “export” Jewish nationalism to the Arab World. تفحص مقالة إيلي أوشروب نظرة الفلسطينيّين لوعد بلفور على مدار القرن العشرين وحتى يومنا. إن التصوّر العربي السائد القائل إن اليهود ليسوا "شعبًا" بالمفهوم الحديث، بل "طائفة دينية"، تستند بصورة عميقة إلى العلاقة بين الصهيونية والإمبريالية منذ سنة 1917. يقدّم لنا أوشروب مثالاً على ذلك ويقول إن الوعد البريطاني لإنشاء وطن قومي للشعب اليهودي في فلسطين قد ساهم في تعاظم الخطاب العربي حول القومية اليهودية؛ وقد بلغ هذا الخطاب ذروته بعد سنة 1948، إذ تحوّل رفض القومية اليهودية إلى مادة رسمية في الأيدولوجيا الفلسطينية. ومع هذا، توضح المقالة أن أعضاء مركزيّين في النخبة الوطنية الفلسطينية قبل سنة 1948 قد صدّقوا على فكرة القومية اليهودية، لا بل وأنهم قد وافقوا في الثلاثينيات على التوصّل إلى حل وسط مع الصهيونية والإمبراطورية البريطانية والاعتراف بـ"الصهيونية الروحانية" لتشكّل إطارًا أيديولوجيًا لإنشاء وطنًا قوميًا يهوديًا في فلسطين عملاً بما جاء في وعد بلفور. تركّز المقالة على يوسف هيكل، القائد الفلسطيني والمفكّر المحلّي من مدينة يافا، والذي مثّل فكره الدور الذي لعبت فيه كتابات آشر غينسبورغ (والمشهور بلقبه الأدبي: إحاد هعام، ت 1927) في تشكيل النظرة العربية الموضوعية (البراغماتية) في الثلاثينيات.